It’s become almost an annual ritual now. Even though we don’t specifically plan to go to Sonoma and Napa every year, inevitably we end up there, year after year. There seems to be a magnet continuously drawing us to that region. I’m excited to start a new series on some of the places we visited this past October when we went to Sonoma and Napa. It was a weekend trip to visit friends and also to celebrate Bryan’s birthday. I was thrilled to partner with Sonoma Valley Visitor’s Bureau again. They did a fantastic job helping me set up an itinerary with only a couple weeks’ notice. I’ve worked with them for years now, and they are a fantastic resource. Here’s a summary trip report. I have several more posts lined up that go into much deeper detail about each of these locations. Every year around autumn a lot wineries in the region hold release parties to announce the arrival of the year’s new vintage. It’s always exciting to taste new wine, and the release parties are quite fun. We had the opportunity to visit Chateau St. Jean‘s fall release party for their flagship wine, Cinq Cepages. This particular year they did something special – they invited Michelin starred chef Bruno Tison from Sante Restasurant in Sonoma to cook four dishes to pair with the wines. In fact, we tried eight wines, two different glasses with each course. It was quite informative, interesting, and fun. Afterwards, they let us roam around the grounds, taste grapes from the vineyard, and sip on wine paired with cheese. Bryan even won the second place prize in their raffle, a fun vertical tasting of their flagship wine Cinq Cepages! Can’t wait to go back and redeem the prize. We tasted lots of other wine while in Sonoma Square, the heart of Sonoma Valley. We enjoyed a wine tasting at Sojourn Cellars and bought half a case of their Pinot Noir to take home. We sampled 10 wines from a very new producer in Sonoma Square, Corner 103, located right at the corner of the square with gleaming brand new tasting room. We stopped by our good friend Robert Kamen’s tasting room (also in Sonoma Square) to taste his new Lava Block Cabernet (it’s phenomenal). We are wine club members of Kamen and regularly drink their excellent Cabernet Sauvignon. We had a lovely dinner at Cafe LeHaye, located right off Sonoma Square near the tasting rooms. The room was super cozy, the food was great, and the owner was extremely warm and hospitable. We really enjoyed our meal there. Between winery visits and restaurant meals, we spent a couple hours zip lining between redwoods trees with Sonoma Canopy Tours. The tours were super well-run, and it was clear that all of the instructors really loved what they did. Their enthusiasm was infectious, and their professionalism made me feel safe at all times. We had an incredible dinner at Torc, a great restaurant located right in downtown Napa on Main street. During the time we were there, white truffles were in season. Of course we had to get some, and it was absolutely incredible. One bite transported me back to Alba, where I had last enjoyed such fragrant white truffles. Our last evening we celebrated Bryan’s birthday at Farmhouse Inn, a lovely Michelin starred restaurant that’s part of an inn. The restaurant focuses on dishes made with farm fresh, local ingredients. The food was exquisite, and for fun we ordered an old (1971!) Produttori del Barbaresco to go with our meal. 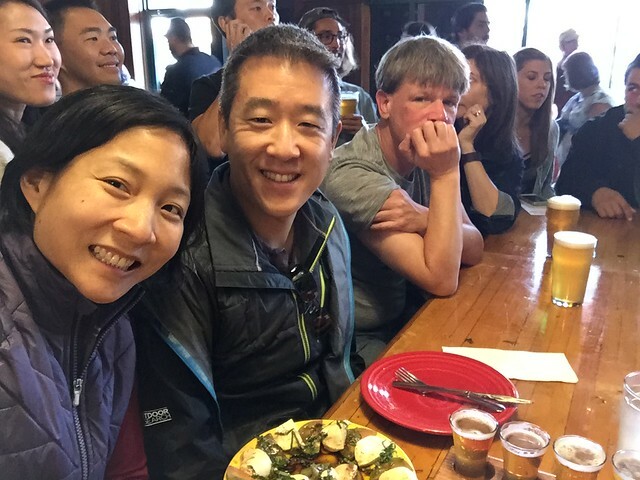 Last but not least, we had to stop by Russian River Brewing to enjoy a late afternoon meal (I think we showed up around 2PM but grabbed a seat at the bar without having to wait too long). Of course, we picked up tons of beer (30 bottles!) to carry back with us in our suitcases. This time, none of them broke! Woo hoo! Stay tuned for more details posts showing all of the amazing details from the restaurants and wineries I described above. Disclaimer – I partnered with Sonoma Valley Visitor’s Bureau for this series. They helped me set up several of these visits and I did not pay for the experiences that were part of the itinerary. All opinions are my own, and I was not paid to write any of these blog posts.